Tips, in LBRY Credits (LBC), are an integral part of our community because they allow us to reward members for their contributions - whether that's for sharing something insightful, providing feedback, completing bounties, testing our various apps or helping promote LBRY's vision and technology. You can earn them, share, or transfer them via simple commands on the Discord server by interacting with the tipbot. 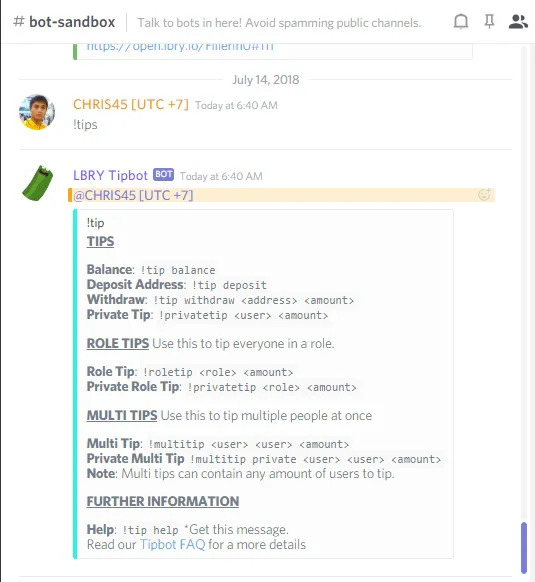 It is important to note that the LBC stored as a result of a tip is tied to your Discord account username and are stored on LBRY's wallet server. It is your responsibility to withdraw the tips to your LBRY app or to another third-party wallet like Coinomi. If you plan on storing LBC on the Discord server, it is a good idea to enable Two Factor Authentication (2FA) on your account. LBRY takes no responsibility for lost funds due to negligence. Use the following commands to make amazing things happen. We recommend running them in the #bot-sandbox channel, unless you are tipping someone! This displays a list of tip commands and how to use them. Displays the balance of your Discord LBC wallet. Displays your Discord LBC wallet address. Useful if you want to receive LBCs directly to your Discord wallet. Use this to withdraw a chosen amount from your LBC Discord wallet to another LBC wallet such as the wallet in your LBRY app, Coinomi or to an LBC wallet on an exchange. Want to tip someone privately in a personal message? This will send a tip to your chosen username in a private personal message. This will send your set tip amount to all the users you list. This will privately send your set tip amount to all the users you list in personal messages. Want to tip a Discord role? This will send a tip to your chosen role. Want to tip a Discord role privately? This will send a tip to your chosen role in a private message.